This is Warren and Jane’s thank you party to all pupils who danced in 2018’s Champions of Tomorrow, Stars of the Future, British Open Championships in Blackpool….and, of course, the cast of Baby Ballroom. 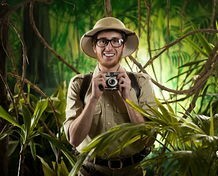 This years theme is ‘Jungle’, so wear camouflage, or create your own animal or plant themed outfit if you can! Includes complimentary BBQ, soft drinks and open bar. There will be no charge – this party is a thank you from Warren and Jane for all your support and hard work! There will be lots of fun and games as always and inflatables in the garden for the kids. Please let us know if you plan on joining us, as we will need to know how many people to cater for. You can do this by messaging us on Facebook, sending us an email, or giving us a call on 01902 897 900.